Sorry this took so long to create! This is the transcript of my Entomological Society of America talk that I posted last week. I have taken the liberty of editing and prettifying things up, and including some feedback on the draft version I got. You can download the PDF handout from this talk here, including some recommended links and resources. Why do this social media stuff, anyway? Why was Bug Girl successful? How can YOU become an online entomology goddess? The first big question is WHY would you want to participate in social media? It takes a lot of time and effort, and sometimes people are rude to you. So, why the hell would you want to do this, anyway? In my case I actually began blogging around 2004. I wanted to challenge myself to be a better writer, and the way to be a better writer is to…write. I wanted to communicate my excitement about insects and science to anyone, regardless of their background. And, maybe, to also persuade them that insects are kind of cool. The unique nature of blogging is that you get a great deal of feedback on your writing. It may not be kind feedback, but you will get feedback. It’s a great way to find out if the point you thought you were making is actually the point that everyone got. Blogging is about trying things out and learning to communicate more effectively by, in some cases, trial and error. I am currently working on a project to survey bug bloggers. The preliminary data I’ve gathered so far indicates I’m not the only one that considers the general public as my primary target audience. The majority of people writing and blogging about insects seem to have similar goals to mine: communicating our science to the general public. When you look at the way science has traditionally been communicated, it’s a very different model than the blogging/social media environment we have today. 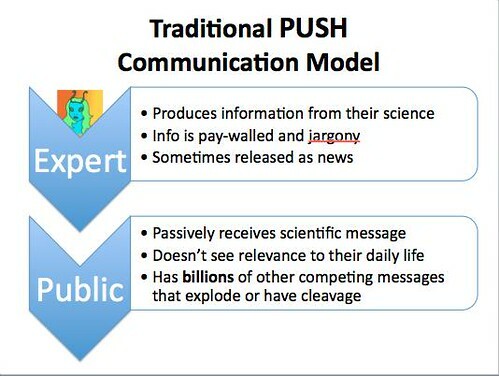 It corresponds to what is known as a Push Model. An expert produces information from their science, but it is usually protected behind pay walls and full of technical jargon. It’s not easily accessible by the general public (and frankly, sometimes not by other scientists, it’s so dense). Occasionally research may be communicated as a press release and picked up as news, but for the most part scientists are just talking to themselves. If something does actually manage to make it into the news, the public passively receives this news information; it’s not seen as relevant to their daily life since it’s usually presented as a factoid devoid of context. There are billions of other competing messages that explode, have cleavage, and that are way more marketable than what scientists are doing. Social media and blogs completely change the way in which science is communicated. Instead of having an expert broadcasting specialized knowledge at the public, you have a two way-transfer of information. I create content to draw an audience in and start a conversation; the audience will provide feedback. My readers may say “that didn’t make sense” or “that’s cool, but that’s not what I’m interested in. Here’s what I really need to know.” I then respond to that, addressing my information to what they want to know, not what I think they SHOULD know. It’s a conversation, not a lecture. 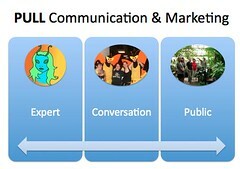 I have deliberately used the word marketing here, which upsets some people–it’s a dirty word for a lot of scientists. If we want to succeed, we should to use the tools of marketing in order to draw people in and engage them, and get them to understand why they should care. Good scientific information is a product we have to sell. Real communication with real people has been repeatedly shown to make source validity stronger. More trust is developed. When you engage people and they develop a relationship with you, you become more than a talking head issuing sound bites. You are a trusted BRAND. One thing you might wonder is, “Ok, fine, whatever, so I’m a brand–Then who are my competitors? Other science and insect bloggers are my collaborators, not my competitors. We are all doing the same thing. We’re trying to get people who are not specialists interested in insects and science. These are my real competitors: (photos of Jessica Alba, Glen Beck, and football players). This is who science messages are really in competition with. We can’t just keep telling people that we are doing important stuff. We have to show them and convince them directly. It isn’t just public outreach; it’s public engagement. It’s not enough to write interesting stuff and toss it onto the internet waters. You have to actually engage people in conversations. You have to invest time and energy in building RELATIONSHIPS with your readers, whether they are on your blog, Facebook, Twitter, G+, or elsewhere. You have to start talking TO them, not at them. My blog isn’t as dominant as it once was, but I s till do OK for a part-timer. From 2007-2010 I was ranked fairly consistently in the top 50 science blogs. At the beginning of this year, I ranked 45 on Wiko for ALL science blogs. In the world. That aint’ bad for a blue broad with antennae. Why did that happen? When I first started blogging, I was one of the only bug bloggers around. There wasn’t any competition, it was an empty niche, and I was able to establish myself and develop name recognition that is still working for me today. That’s Blue Water. Someone starting now faces Red Water; there are sharks, and the online environment is bloody and competitive. Other dumb luck that worked in my favor was that I choose a blog name that is at the beginning of the alphabet. This puts me at the top of long blog lists. One of the things I did that turns out to have been a smart move was to become a guest writer at skepchick.org. Perhaps the easiest way to describe skepchick is as a feminist critical thinking blog. To give you a sense of scope, I get on average about 1000 hits/day at my blog these days. Skepchick gets an average of around 15,000-20K readers/day. So, posting over there is a huge expansion of the number of readers I can engage. The other exciting thing about being part of Skepchick is that they have spun off a non-profit foundation, WTF, which stands for Women Thinking Free, and they are involved in several exciting projects to promote vaccination. Skepchick has also invited me to go to science fiction conventions; I’m part of “Ask a Scientist Panels“. My effective reach is greatly expanded; and I have lots of fun as a bonus! A decision that was critical to my success was making a conscious effort to avoid using jargon. One of the very exciting things that happened was being named in Jon Swift’s “Ten Great Blogs You’ve Never Heard Of“. This doesn’t really sound like much of an honor, but it was–this list was compiled by a professional humorist. This told me that I was successfully meeting my goal of writing in a fun and readable way. The other thing that is notable about this mention is that I was the only science blog on Jon’s list. When you take into consideration that only about 2% of all blogs are actually science blogs, it’s even more exciting that I made that list. No matter what your target audience is, writing online is very different than writing for print. You can’t write the same way that you would for a paper publication. I choose to use adult themes and language on my blog because… Well, in part because I can’t do it at work, and some things are just so annoying they really need a swear word. I have heard many times from folks that say ” I really like your site, but I can’t link to it because it has adult language.” That’s ok; I don’t have to write for everyone, and that’s part of who I am and my online persona. I also have a fairly activist stance, and have chosen to confront the media when they get an insect story wrong and publish things online that are incorrect. 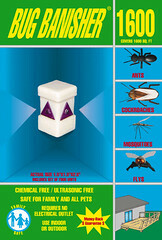 I also point out quack insect remedies and fraudulent devices on sale. So, that’s a summary of why I think I was successful. I’ve measured that success in a variety of different ways. If you are blogging as part of a job or career building activity, you should plan to measure and document your progress. I’ll pick on Klout as an example of a ranking service. You can get a rank from Klout, and they will tell you over time what your magic Klout number is. You even get graphs to show you how it goes up and down over time. At the time I took this screenshot, my Kout Score was 65. The problem is, What does that mean? No one really knows, because it’s a secret algorithm. It’s a number, but you don’t know how it’s generated. You can benchmark yourself against other people to get a vague idea of how you compare. 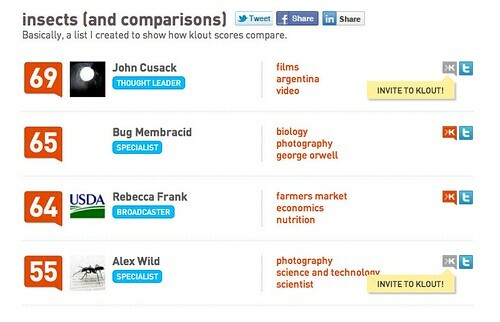 Discovering that I had a Klout score near Carl Zimmer and John Cusack was probably the second best day of my blogging career. But it still doesn’t really tell you anything. John Cusack has a whole lot more followers and influence than I do, as does Zimmer. Whatever the magic Klout algorhythm is that generates this score, it’s not the whole story. It goes up and down pretty randomly, and sometimes decides you are authoritative about some pretty strange things. The real problem with Klout and other ranking services is that they foster a competitive mind set. I don’t want to view other science or insect bloggers as competitors. It’s really easy to get obsessed with the numbers and how you compare, but what is important is being able to show X number of people are being impacted by my writing. Not that I have a higher score than you (Neener). Qualitative measures are more fun to track, but you have to be strategic about it; because you have to decide how you are going to track it, how many will you track, and how you will integrate that information back into your portfolio. I occasionally save nice comments and tweets that people make. You can’t always count them, but they sure are entertaining, and can make you happy just re-reading them. On Twitter, especially, you can’t count on something remaining from one day to the next, so screenshots are important to save. I don’t have a firm criteria on what gets saved, other than things that make me go “Awwwww” and blush when I read them. I suggest you be a bit more strategic than that. You can also count and document what I call “little victories”; for example, I got Nature to agree that “bed bug” is properly two words, even though the AP style guide says it’s one. I’ve been able to point out glaring taxonomic mistakes and get people to update their materials. WIN! There are also a lot of things I did wrong. I didn’t register a domain name early on, so I ended up being locked into the web address I have now. I didn’t use a pseudonym that is truly unique (there are at least 30+ Bug Girls online, including an Australian rock band). I didn’t start keeping track/quantifying of all this stuff until about 2007, so there is a big gap in my records. One thing that I’ve really fallen short on is consistently commenting on other bug blogs, which is part of growing the community. The more you talk to others, the more they will engage with you. The more you link to other people, the higher everyone ranks on Google and the better the information and feedback that gets shared. There also were things I did not expect in my blogging career. I did not expect I would have to create a “Bug Girl will not Diagnose You” page. I did not expect people would take photos of their scabby, scrofulous asses and email them to me, wanting me to tell them what was infesting them. Do Not Want. I also knew I would need a thick skin to be online, but I did not expect how very personal and unpleasant some things can be. You need to be able to separate things people say about you and your writing. Especially if you are a woman, you may experience some fairly shocking abuse. 1. Find your niche/blue water. What are you passionate about? That’s what you need to write about. You have to be self motivated. You have to do this because you want to do it, not because people will recognize you for it. You can’t count on your audience to appear. Who is your audience? Who are you writing for, besides yourself? It doesn’t have to interest everyone, but it does have to interest YOU. And you have to be true to yourself in your writing. 3. The Thick Skin Thing. 4. Be prepared to spend a lot more time and energy than you expect. If you build it, they won’t come–at least not until you’ve been working at it a while. To repeat something I said earlier, it’s the conversation that is important, not just broadcasting your stuff onto the internet. You have to invest time and energy in building RELATIONSHIPS with your readers. The more people you talk to, the more people that will want to talk to you. That is exciting, but it’s also important to think about limits of how much you can handle, and give yourself permission to have an offline life. I only have a distorted idea of blogging. I host a facebook community page, Vipassana, and find that your story brought a smile to my face. Thank you for sharing. A truly excellent presentation, although I think (as Dave Barry would say) that “Scabby, Scrofulous Asses” would be a great name for a rock band. Bug Girl does good work. Maybe I could become famous as “Bug Boy”. On second thought, “Bug Geezer” or “Bug Old Fart” or “Wrinkled Old Bug Guy” would probably be more a propos. Inspiring messages for an aspiring communicator. Thank you. I greatly appreciate your comment on the collaborative, not competitive, online scientist tend to be!